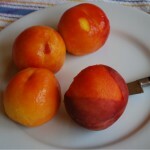 Peaches, peaches everywhere, stone fruits are so luscious and juicy this time of year I inevitably purchase too many. I like yellow peaches, cling peaches, free stone peaches, white peaches, really fuzzy peaches, donut peaches, and the other day, I saw a clever name Saturn Peaches! 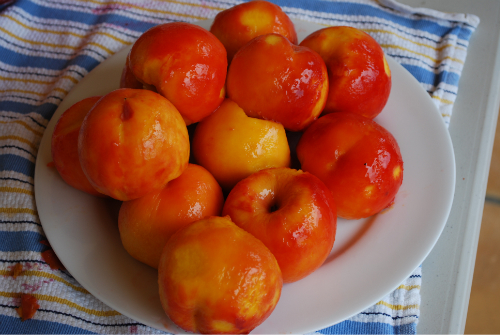 Peaches eaten out of hand are a sensual experience, the intense flavor, the juice dribbling down my chin takes me back to my childhood and eating late summer peaches in the orchards in Eastern Washington. My mother- Nona- would buy cases of peaches in rough wood boxes, individually wrapped in special purple paper to bring home and preserve in big sterile glass jars. She would preserve enough to eat throughout the long dreary dark winters in Seattle. 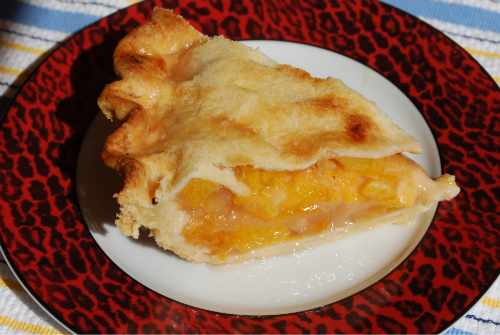 Peach pie is a fantastic treat. It is non-dairy and a light finish to any barbecue or special dinner. 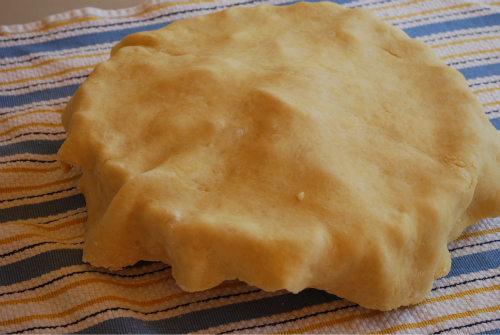 I make it a little easier to whip up by making pie dough ahead and keeping partially flattened discs of dough in heavy duty plastic bags in the freezer. 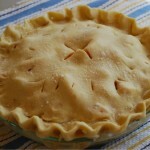 Pie is a great way to use up fruit when it is getting overripe before your family can eat it all. 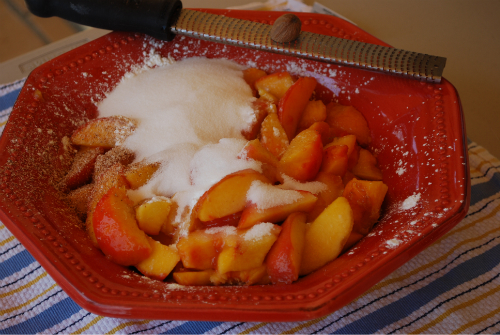 For the dough, combine the flour, salt, and sugar in a bowl. 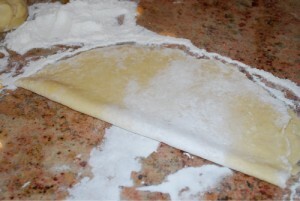 Place the shortening in the flour mix. 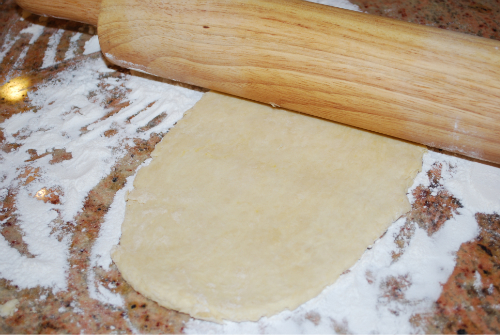 Cut in the shortening using a pastry cutter until the shortening pieces suspended in the flour are the size of peas. Combine the egg, vinegar, and ice water until well blended. 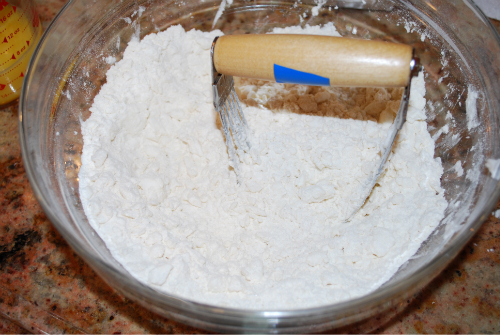 Pour the liquid into the flour, stir a little with a fork, and then press the dough together with your hands. 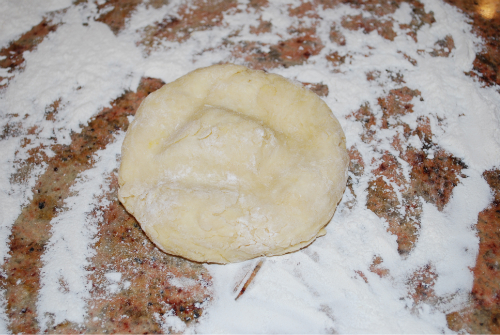 Gather the dough into a ball and separate it into two discs. Flatten the disc a little and place it on a floured work surface, like a stone or wood countertop. The floured work surface will keep the dough from sticking. 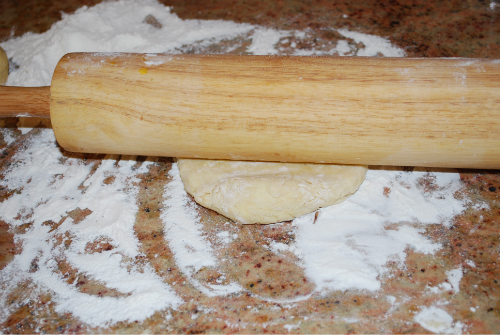 Dust the rolling pin with a little flour as well. Roll the pin back and forth over the dough once or twice, then turn the dough 90 degrees, and roll back and forth again. Take care to avoid rolling over the edges as this makes the edges to thin. Repeat until the dough is about a 14 inch circle about an eighth inch thick. 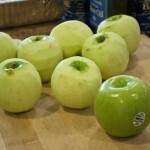 Fold the circle in half and then in quarters. 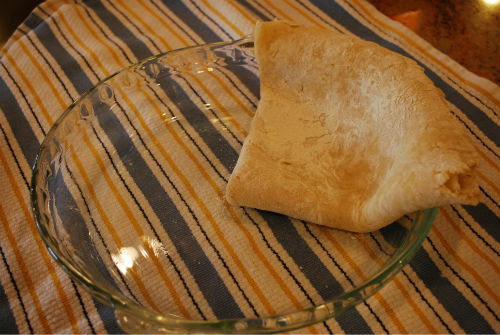 Transfer the folded dough to a round deep dish pie plate. 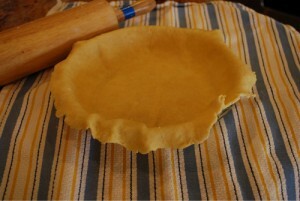 Put the point of the fold in the center of the pie plate and then unfold the dough. 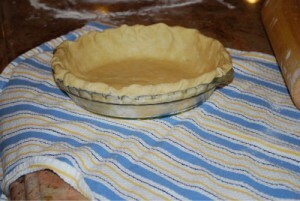 Push the dough into the bottom of the pie plate and up the sides, taking care not to tear the dough. If you do tear it, it is easy to patch so don’t worry. Trim the edges so you have about one inch of overhang. Save the scraps for a little individual pie for the chef. Using a slotted spoon drop two or three peaches into the saucepan of deep boiling water at a time. Take the peaches out after 30 seconds and set aside. Repeat with all the peaches. 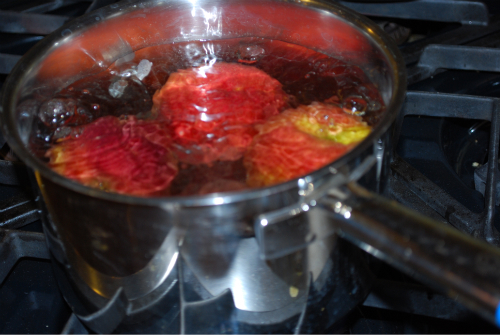 Blanching peaches like this makes them easy to peel and the beautiful red blush from the skin transfers to the meat of the peach. 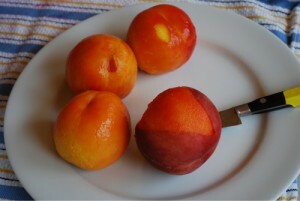 Peel all the peaches, the skin comes off easily at this point, and then slice them into ½ inch slices. Place the sliced peaches in a bowl and combine with the other filling ingredients. 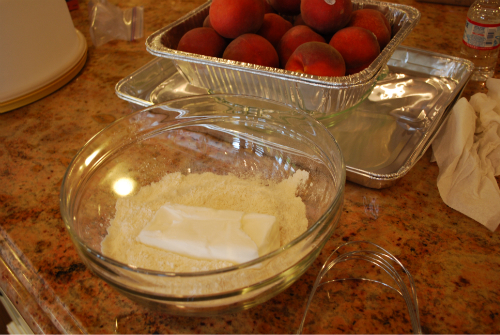 Put the peaches into the prepared pie plate. Now roll out the second crust for the top. Center the pie crust folded in quarters over the peach filling and unfold to cover the pie. 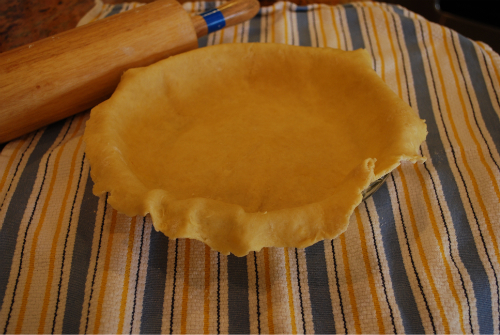 Trim the crust to match the bottom crust. Press the edges of the two crusts together and using your thumb and index finger turn the edges under to make to make a circle of thicker dough on the rim of the pie plate. 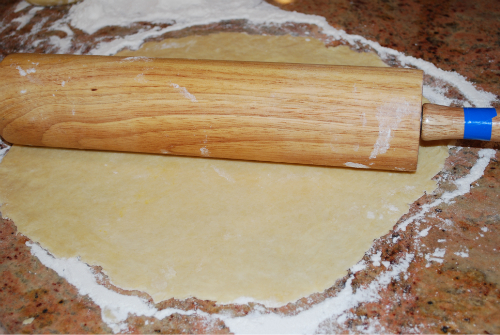 To make a decorative edge, grasp the thickened dough on the rim between your thumb and forefinger on your left hand, then push your right index finger between the left thumb and forefinger to make an indentation or crimp if you like. 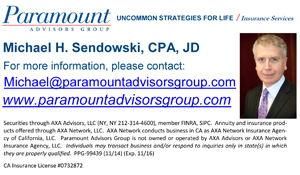 Move you fingers over one notch and repeat all away around the rim. 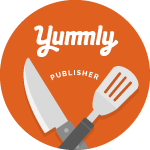 Cut an x with a sharp knife in the center of the top of the pie for a steam vent and poke additional wholes with the knife point in a circle around the top crust. 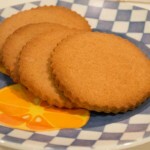 Take a pinch of granulated sugar and sprinkle on the top. 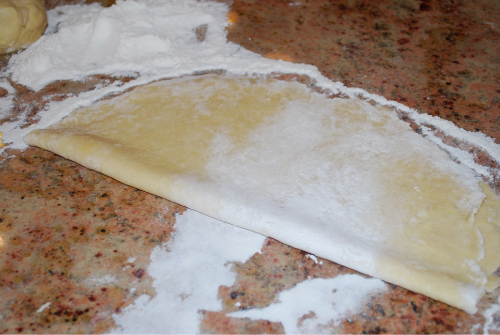 Bake in a preheated 400º for about ½ hour then check to see if the crust is getting to dark. If it is, place a piece of foil loosely on top and turn the oven down to 380º. 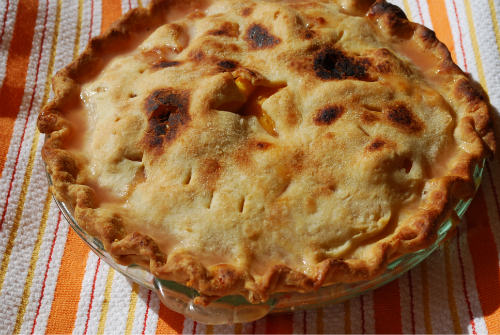 Bake the pie for another 20-30 minutes until the bottom crust is browned, including the bottom crust, and the fruit is bubbling with juice pushing up through the steam vent. 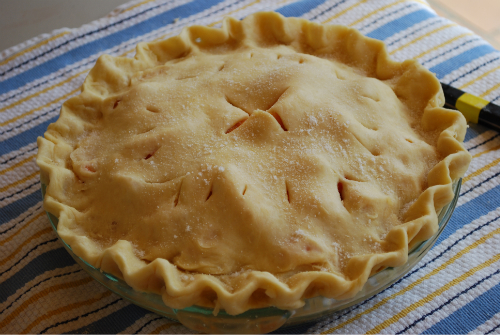 I like to use a pyrex glass pie dish so I can see the sides and bottom of the crust. Make this at least three hours before you plan to serve it. It is great like this or you can pair it with ice cream.